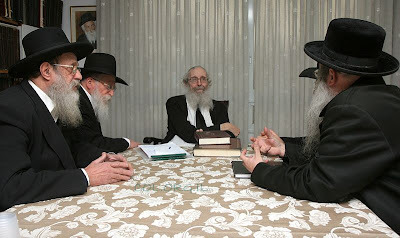 Rav Elchonon Wasserman, Rav Zalman Sorotzkin and Rav Shmuel Dovid Unger of Nitra in Mareinbad. Yes, I know, they were meeting to discuss very important matters. 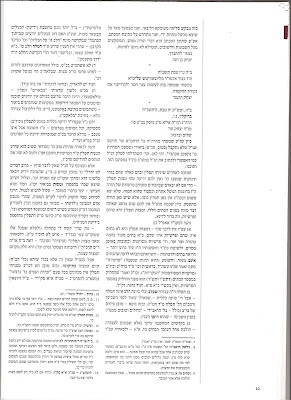 What a chutzpa and ferdishkeit to write (on) the Rebbe that the 12 years (he spent in Berlin and Paris) are a black hole in his life. 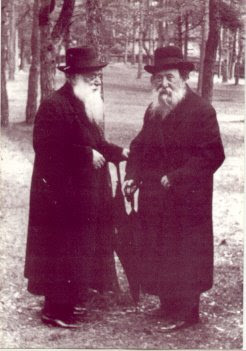 Can I ask you on Rebbes that most of their lives were traveling (and) jet-setting to expensive vacations - even prewar gedolim - while the Rebbe was sitting in his cubicle talking to yiddishe kinder for night after night plus suffering along the plight of Russian Jewry even July and August when the New Yorker tzadikim were in Sharon Springs, Saratoga , White Lake and the lovely Swiss Alps or Teves and Shevat, when all the tzadikim were in Palm Dessert and Miami and wrote tens of thousands letters as the Moreh Nevuchim of our generation. Giving Full shabbos afternoons farbrengens on Rambam, Zohar Rashi Al hatorah while most people were burping from the chulent effect. You can follow almost all his life and see the multifaceted life he led that was unique in Jewish history." The Imrei Emes and The Beis Yisroel with Chassidim. How did he always have such an entourage with him where ever he traveled? Did they all have money for such trips? "Did you ever see the deep kabboloh discussions he had with his great father in the years of Paris and Berlin, or his reshimos from those years a smorgasboard of Bavli, Yerushalmi, Midrashim , kabala and chassidus, or the letters that his father begs him to stop with the taneisim. Not too many yungeliet like these were walking on the holy streets of Warsaw, or Grossverdein and not even in Belz or Ger. 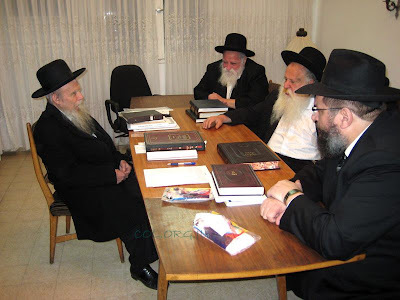 The Rebbes that didnt produce that amount of torah have rather a black hole in there resumes." 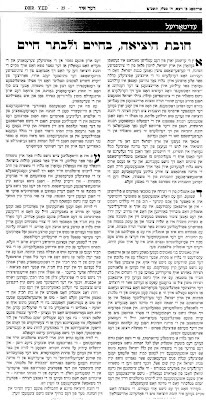 עכ"ל Basically, what the commenter is saying is that we see what became of the 12-year "black hole," namely utter devotion to Klal Yisroel with very little regard to his own well-being. 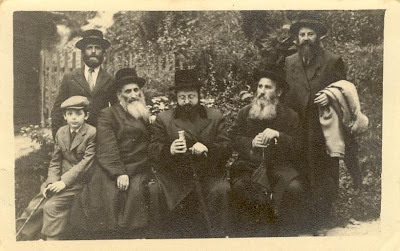 Vacations are important in a man's life, and especially so in the life of an Ish Tziburi, the Frierdige Rebbe also traveled to spas and sanitariums to heal his broken body, but the Rebbe saw himself as one who has no time for such trivial matters. 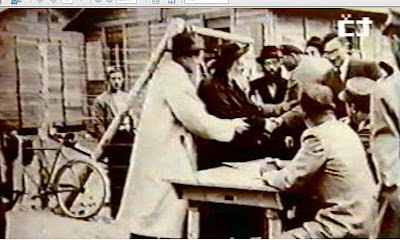 There are Jews that need to be helped and Torah that needs to be learned and shared with Both suffer when one travels. Yes, you can gather strength by walking in Miami or relaxing in Martha's Vineyard, or seeing G-d's Alps, but what do you tell those people that need your help at that time?! We need to realize once and for all that there are some people that are beyond our comprehension, and yes, beyond the comprehension of those who truly Hurreved in Teyreh for many decades. There are some things that even continuous toil in Torah cannot provide. I say that concerning myself as well, but especially to those of you here who seem to have a mental barrier when it comes to Chabad and the Rebbe. Yet, it doesn't take that much seychel to understand that despite what your 9th grade Rebbe or older brother may tell you, anybody who had any contact with the Rebbe had at least common decency and respect for him. To attach your own fantazyes to a man - let alone a Rebbe - is beyond wrong, and the above comment shines a harsh light on that fact. I know that we beat this topic to death, but some of you need to be reminded of this quite often, for some reason. I apologize to the Lubavitchers among you who think I stoop too low here by allowing certain comments to pass, but sometimes that's what's needed to educate the ones who know no better. Reb Chaim Shmulevitz was different. It wasn't about him or his aspirations, it was about teaching and about Torah and about instilling Midos Tovos in those who would hear what he has to say. He was old school in the sense that he never picked up the Brisker - or whatever you call it - shtick that others did, maybe only because it was just becoming in style, but I doubt that. 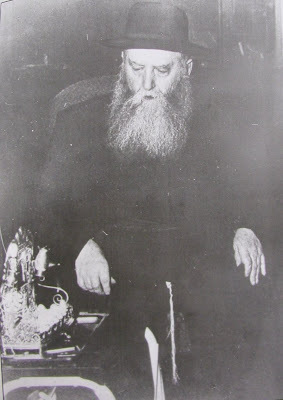 They say it was partly due to his being an eynikel of the Alter of Novardok that he had such a unique approach, almost Chassidic in nature as compared to some of the others. His shmuessen were warm and kind, and I believe that's why you hear "love" just as much as awe and respect from his talmidim to him when they reminisce about Reb Chaim.I don't pretend to be a mayven on Reb Chaim, or on any other Torah personality. As a Lubavitcher I can appreciate his tremendous devotion to learning and building Torah. I can appreciate his style despite the general chassidic approach to "misnagdim," because he seems so warm and genuine, as opposed to some of the others. There was some good reading this weekend in the Jewish newspapers and magazines, with the writers coming from all sides of the spectrum. That tells us a lot about a man. 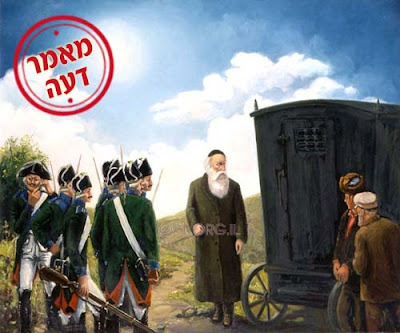 His choice of Reb Nochum as Son in law also does... There used to be a nice site where you could hear shiurim and shmuessen, I can't find it online. Anybody know what happened to it? A Friend of the Tzig and the Tent saw these words by the Holy Piasecner as very appropriate in light of the tummel some people made after some of the hespedim in Kfar Chabad 4 weeks ago. It went so far as G-d's lawyers plastering Jerusalem with Pashkevillen about the "heresy" that was spoken at the funerals. 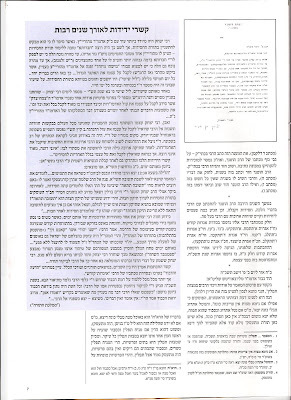 Reb Klonimus Kalman HY"D mentions the fact that there have already been times in the past where Jews suffered death and destruction, and still it doesn't arouse questions of Emunah in the average Yid's mind when he reads and learns about it, so why should the decrees of WW2 do that? 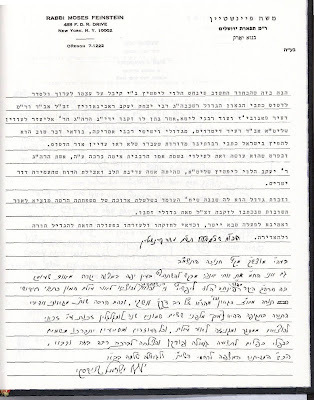 Yet at the bottom of page the Rebbe of Piasecna sees fit to "change his mind," and announces to the world that Tzores like those suffered by the Jews of the Warsaw Ghetto and the environs - that they were deported to death camps etc. - HAVE YET TO BE SEEN BY KLAL YISROEL. 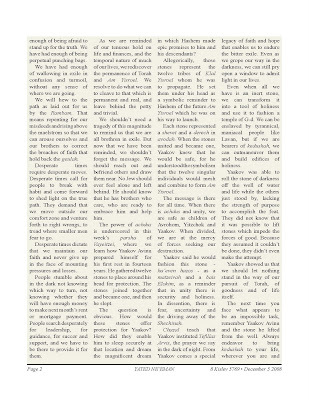 It's almost as if RKK had changed his mind when he wrote the הגה"ה, as if the reasons for him justifying G-d's ways and leaving no room for questions in Emunah just fell away in the year that had passed from 1942-1943, and now there were only questions - but no answers.... Do you too see it that way?! Most of us - notice I say most, not all, there are many exceptions - have no real love of yiddishkeit and/or Hashem. We go through the motions and we do what we have to, and in these trying times it may be all that G-d could ask for, but the fact remains that we have ulterior motives. They may be positive peer pressure, pressure from parents and mechanchim, or fear of being embarrassed by misbehaving, which I guess is a Toldoh of peer pressure. 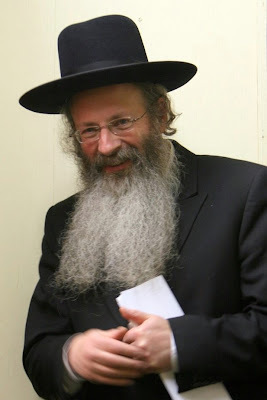 Most "mishmeres haTznius" groups will agree that the best fear tactic to use against somebody they say is stepping out of line is publicizing his picture or telling his Rosh Yeshivah, because that's the last thing most people want - that people know what they're up to. I'm not speaking about women, neshomos DeBan have a totally different makeup - excuse the pun - I speak only of men. There also is the element of shame. Many Jews, when confronted with their practices by the more "enlightened" begin to see that lots of what they do makes no sense to the naked eye. They look at themselves and see that what happens in Iran often happens in Brooklyn and Jerusalem too, so they begin to wonder. They wonder how they're any different than the radical Islamist, other than they have no access to guns so they don't use them. Yet. Others react by trying to make yiddishkeit more "normal." They dress and look normal, educate themselves and their children, and generally try not to stick out more than different that the average Western man and/or woman. Passing by a proud display of Judaism on an otherwise normal street reminds them how their brethren - and, by extension, them too - are weird, and they don't like to be reminded how weird they really are. Despite their fancy homes and cars. 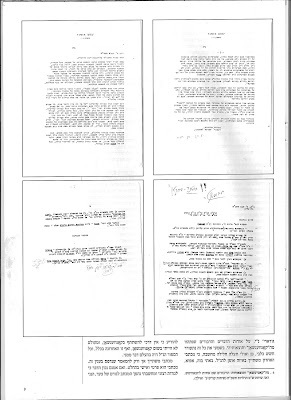 "ובצפי' עמוקה להתברך.... יצחק בן חנה"
These letters were penned in 5728/1968 after the Rebbe had announced Mivtza Tefillin, namely putting on tefillin with any Jewish male over 13 years old, anywhere (almost) and anytime (from the z'man in the morning till shkias haChamoh.) 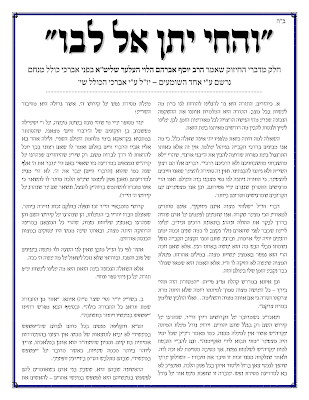 Rav Yitzchok Hutner zt"l, Rosh Yeshiva of Yeshivas Rabbeinu Chaim Berlin in Brooklyn writes to the Lubavitcher Rebbe, זצוקללה"ה regarding his concerns that he had over this new campaign, including the need to tell the people you were donning the tefillin on that there were parchments inside that had the parshios of krias shema written on them. 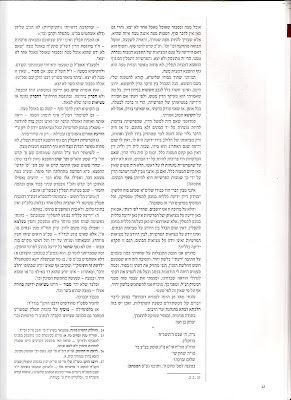 We see the respect RYH has for the Rebbe, and how he wants to understand the Rebbe's words and opinion in the matter. 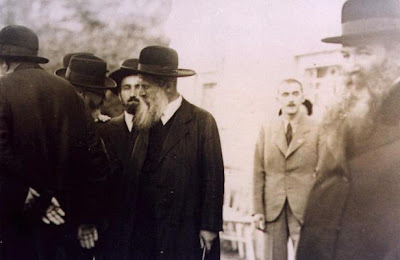 There's also the denying of ever speaking out against Lubavitch during the '67 Agudah convention, or being present at that or any other convention for that matter, to the point where he begs forgiveness and asks to be blessed by the Rebbe. "ישנו יהודי וואס קאכט זיך אין מהר"ל..... יה"ר שזכותו של המהר"ל תעמוד לו להינצל ללא פגע"
How much more proof does one need?! I did not know there was so much animosity to the leadership in Lakewood. I promised the guy I'd help him by getting the word out, although I don't wish to be a clearing house for Loshon HoRah. 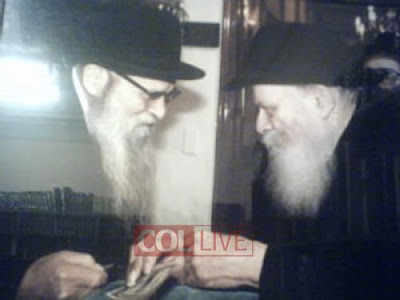 The picture of Reb Malkiel looks nice, an emese hadras ponim. What can I say, it's sad to see all the fighting in every kreiz. 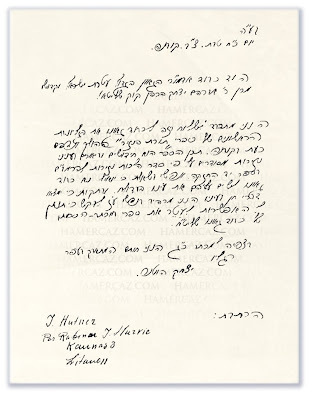 By the way, the letters from Rav Hutner to the Rebbe from 5728 will be up shortly, iy"h.
Use the arrows at the top of the page to maneuver between pages. I do not know who wrote the sefer. I cannot imagine - wait, I can imagine - how Satmar will respond to it. 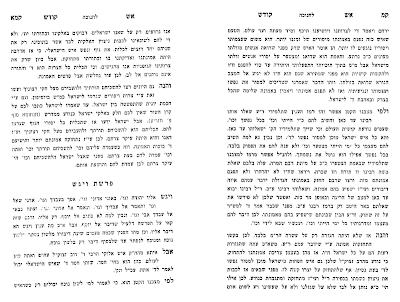 The Hakdomeh says the sefer has been around for quite some time in a typed format, but never has it been mass produced. 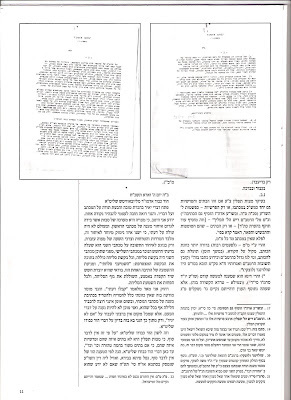 Satmar has long claimed that the VaYoel Moshe makes an airtight case, and that all others act against Halochoh when they collaborate with the State in any form. The fact that nobody refuted the VM was proof in their eyes that nobody could. This sefer begs to differ. Sent in by reader Abarbanel. Enjoy. 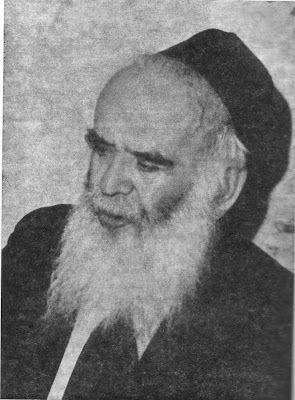 The Makarover Rebbe of Winnipeg, Canada. From an Anonymous reader. Must Be Clicked on to fully enjoy! 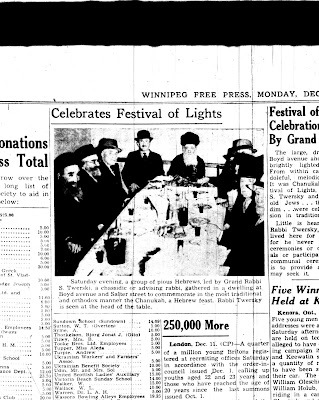 Chanukah Fabrengen in Winnipeg. I guess they figured it was press worthy! 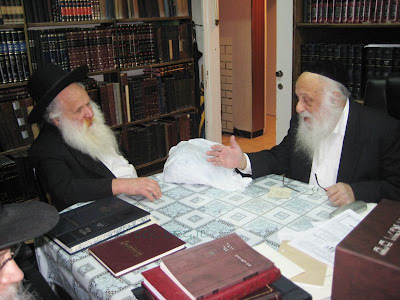 My father's rebbe, Reb Aizik, and his name dilemma, and how Reb Lazer Silver hut mechaven geven tzum Rebben. I always knew that the Rebbe had once told that to somebody, but I never heard it from any other source. 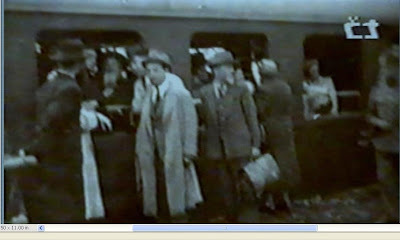 The pictures here are a series of three pictures seemingly taken from a newsreel where the late Satmar Rov, zt"l is seen before, during, and after the Kastner Transport train that took him and over a thousand six hundred well-connected others to safety in Switzerland. Not before a four month furlough in Bergen-Belsen, though. I have yet to see them before, and neither have some people very familiar with history seen them. The Rov looks so out of place amongst all the irreligious looking Jews there. 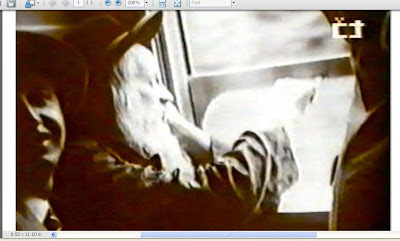 The picture of him looking out the window shows a very concerned Rov, wondering where this will lead him, where his talmidim and chassidim will end up, and maybe some discomfort as to his surroundings too. 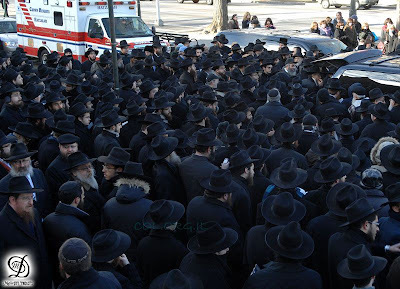 The subject and controversy of the rescue is one that Satmarer Chassidim are well aware of, and one they take very seriously, especially with the aspect of being saved by the Zionists. 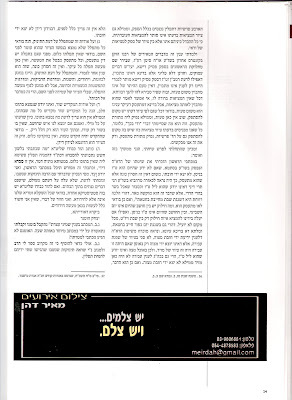 A Yiddish book, written by Hershel Friedman, has recently been published, and there he tries to debunk many of what he calls myths that the Tziyonim spread about the Rov, but I could not find it in the stores here. 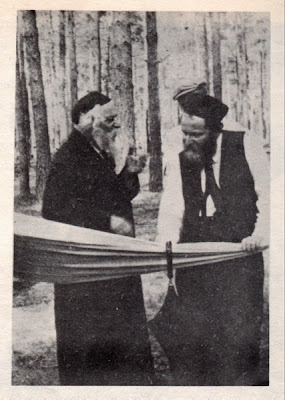 Other claims, like where the Chassidim say that the Nazis did not see the Rebbe's beard and peyos, or they thought the kerchief he had on his face was due to a toothache, may be addressed in the book too, I don't know. Maybe one of you read the book? נבלה עשה בישראל, שאלו שקוראים לעצמם "גדולי ישרא-ל"
All kidding aside, a delegation of Chabad Rabbonim and askonim visited with leading Litvishe Rabbonim and Roshei Yeshiva and invited them to attend the upcoming shloshim event to commemorate the Kedoshei Mumbai Hy"D. Another delegation also visited Chassidishe Rabbonim and Admorim and presented them with the new Tanya Chassidus Mevueres. 1. You need to hit the books in a big way. Perhaps you were prevented from attending yeshiva full time, or maybe you’re just as naturally unintelligent as you sound…- either way, you need to learn to read Hebrew post haste. 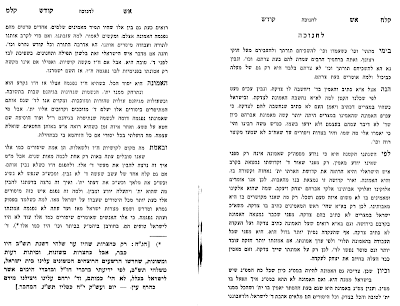 The sources for the minhag in many kehillos not to be maspid are the easiest things to find, had you bothered opening a Shulchan Aruch. 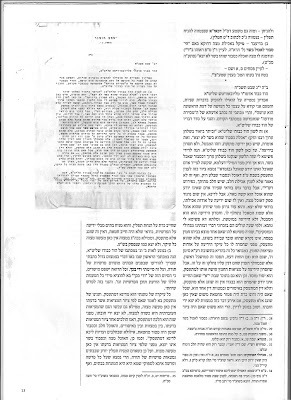 While I wouldn’t expect you to have ever heard of the Reishis Chochma, much less be familiar with his stringent warning regarding hespedim, you might have known both the reason for this minhag, as well as the fact that many communities other than Lubavitch follow it. You might practice keeping quiet about things you know nothing about, and while this would mean your being silent most of the day, you’d also save yourself considerable embarrassment. 2. If you can’t learn a sefer in the Hebrew original, I suggest you go to a library and try reading books in English. There’s a whole world outside Chelm that you obviously know nothing about, not to mention your astounding ignorance of Lubavitch (and likely most other) practice and history. This will be news to you, ‘Burechel’, but over 80% of all Lubavitcher customs are based on chumros in halochoh. That’s right, not al-pi-kabolo, derech hasod, or anything else, simply being choshesh le’daas hamachmirim. If you’d bothered learning the Shulchan Aruch HaRav, not to mention studying his siddur, this would all be very obvious, but you prefer hurling slanderous accusations to real information – what a surprise !! 3. You then, shamelessly (“shoteh aino margish…”) claim that;“What riled me was the Tzig (and this as an example of most Lubavitchers)had never,ever asked himself why Lubavitch sought to be "kliger" than the whole world.”. You mean smarter than you ?! What is immediately obvious to anybody reading your ignorant rants, is what it is about Lubavitch that really bothers you. 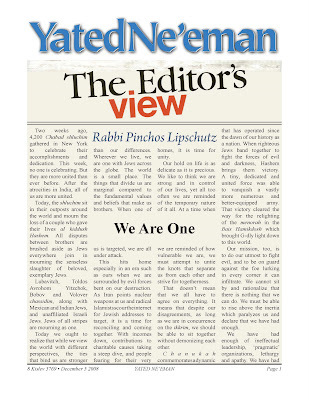 What bothers you about Lubavitch is exactly the same as what has bothered generations of anti-Semites about Jews in general, i.e, “…”Why are you different – why can’t you be like us – Why do you think you’re better ? !” Well Burech, the answer in this case goes something like this. Lubavitch as a chassidus (and as a movement) is about doing things. No, not just things like visiting a few kvoorim once a year…. Lubavitch is about learning chassidus, teaching, reaching, building, understanding, changing….. you see Burech, Lubavitch is about achieving, so of-course you hate them. Their very existence showcases your failure. But is that their fault ? Your inferiority complex is not their fault. Does it bother you that Lubavitch has sources in Torah for their minhagim, and are honest about their reasoning, is that too much for you to handle? you can’t debate them in learning so you throw stones? 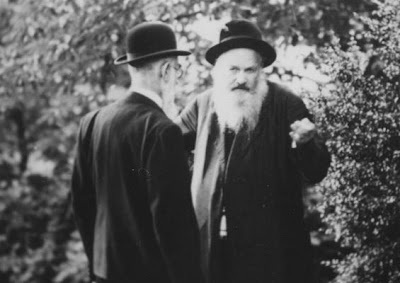 Whatever’s eating at your kishkes about Lubavitch and their Rebbe would pale in comparison to other Chassidisen, in comparison to what’s written about the tzaddikim R’ Mendel Rimanover, the Noam Elimelech, or the Yismach Moshe – but a fool such as yourself wouldn’t know that, would you now? 4. Which brings me to another point. I recommend you apply for a refund to whichever yeshiva was lucky enough to steal your parents' tuition dollars. 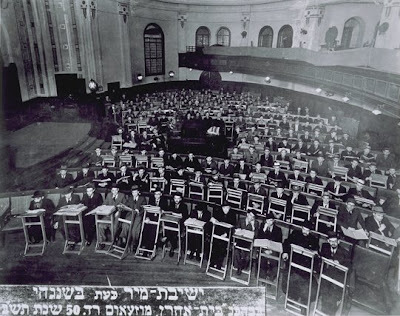 You see, the typical frumme-yid entrusts his children to a yeshiva to be schooled in ‘derech hamishneh ve’hagemoro’ with all the typically attendant benefits of this type of education. Not to mention our mesorah. You obviously got none of this. Did you attend a real yeshiva, or a jihad-factory? You run around ignorantly criticizing others in your elitist hate fest, but you don’t seem to realize what you sound like. Kach hi darko shel torah?!! Which ‘derech’ is this ? Not the derech of Hillel, nor that of R’Akiva ….. How dare you pervert Torah to justify your ignorant attacks? “Boshni mi’divreichem beis Shammai……v’hushcheru shinov mipnei hatzomos” (Chagiga22b). Or is R’ Yehoshua not good enough either. You claim the right to criticize Lubavitch based on your ignorance, yet you ignore the glaring distinction between how they learn Torah, and how you sputter hate. Open any sefer published by Lubavitch, (there are many hundreds of them) and you will notice the voluminous marei-mekomos. Yes ‘Burech’, mekoros, so one can see how the author arrived at his conclusion. That doesn’t mean that you must necessarily agree, but this is darko shel Torah – demonstrating ‘mino hani milli deomar kroh’. Contrast this with the fatwas banning other shittos / groups / derochim that have become a staple of the jihad-factories you attended, and the difference is clear. You don’t like somebody else’s minhag? - fine. But that doesn’t make it wrong. If you have a legitimate problem with it, naysi sefer venechezeh! 5. If you can’t manage any of the above, that’s ok, ‘Burechel’, there’s an easier way that might even work for you…. Go buy a plane ticket, leave the ghetto for a few days, and pretend you’re a decent human being. Stop into a Chabad House somewhere, and see the enemy up-close. What you’ll typically find is a nice guy. He’ll invite you for a free meal, yes- he’ll feed you for free – probably while realizing what aמ ingrate you actually are. You might also hear him give a shiur or two, and realize that he’s a שטיקל talmid-chochom as well. Maybe, just maybe, in spite of all the hate and brainwashing that are your staples, you’ll see the average Lubavitcher for what he likely is – hardworking, dedicated, learned, and happily devoting his life to helping other yidden. Yes, ‘Burech’, even yidden who love to hate, yidden like you! 6. Finally, to address what’s really bothering you, I recommend you take a look at the definition of a ‘machlokes leshem shomayim’ as given by the Meiri on Avos 5:19. You will then understand why Lubavitch keeps growing in Torah, operational success, and stature, while those institutions whose main exports seem to be pseudo-lomdus and jihad, are falling apart and imploding. ‘Sof ganev litliyeh’, and ‘derochim’ that thrive primarily on hate and criticism, will not last very long. Try it, ‘Burech’, and you might surprise yourself. It’s not a mitzvah to remain in such misery. There’s a whole new world waiting for you to discover – the world of ‘Eili v’eilu divrei....’, limud haTorah, and Ahavas Yisroel! I just finished my Yud Tes Kislev Seudah with my Mishpoche. We set the table like Shabbos, lit two candles, without a Brochoh of course, and had a festive meal, Baked chicken and Orzo, complete with L'chaim (Carmel Young) and desert, brownies. We figured that despite the fact that the kids were taught all about the Chag HaChagim at school, that they need see it "observed" at home as well, and in a family setting, showing the importance of the day. I can see some of you jumping out of your seats already, quoting irrelevant gemoros about how adding yomim tovim is assur. 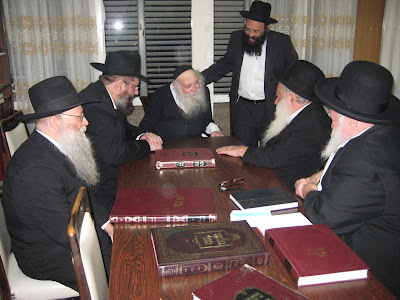 Somehow you'll convince yourself that it's a concoction of the last Chabad generation, and that if Rabbonim and Geonim got along fine with Nesiei Chabad then, then it must be that Chabad did something to change it. Well, my friends, it seems like Yud Tes Kislev as been watered down some after WW2, in the old days it was more of a big deal than it is today. Imagine that! 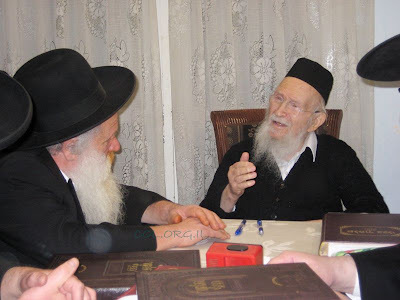 I once heard from Reb Avrohom Aron Rubashkin that in Nevel - his hometown - there was no cheder on Yud Tes Kislev, today all Chabad chadorim have school. אכשיר דרא. 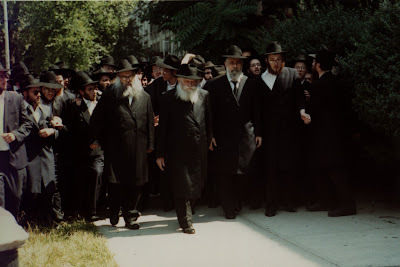 You might ask what is it about this day that Lubavitchers - and many non-Chabad chassidim - make such a big deal of it. You might say that it's the אור וחיות נפשנו ניתן לנו that the Rebbe Rashab refers to that injects that holy light on this auspicious day. Contrary to what many of you may think little is made of the Misnagdic aspect of the story, other than when telling the actual story. This is not a Didan Notzach over Misnagdim, but rather a day of Hachlotos Tovos, a day when the Chassidishe Neshomoh enters one's Guf in an internal way, and when the koach is given מלמעלה to learn and understand chassidus and to follow in its ways. For me these last 2 days have been a Yom Tov in Der Vochen. Days where you can sit on a regular Tuesday, after a day's work, and sit BeDibuk Chaverim listening to vareme verter from a mashpia and singing vareme nigunim. You leave the farbrengen at 3am and you've been transformed to another world, a world where there's only good. At least for a short while you live off those Hachlotos Tovos that you made, until the time comes to recharge the batteries. In light of the fact that the biggest pyramid/Ponzi scheme in history was allegedly perpetrated by the President of YU's Sy Syms School of Business. In light of the fact that such a stink was made of the fact that YU alumnus Rabbi Menachem Genack was kashering unethical treatment of animals and workers. 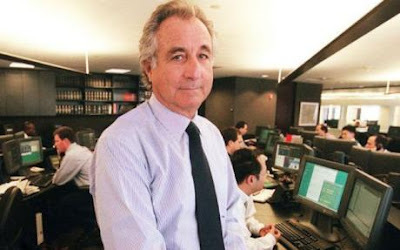 In light of the fact that Billions of dollars were lost to his vast schemes, will these same people be in the forefront of making sure that Mr. Madoff is brought to justice and the monies he stole returned? Not that he won't be brought to justice without their clamoring for it, but still. It would be nice to see a little even-handedness. Brother of Yitzchok, father of Pinchos and numerous grandchildren etc. The niftar was a Rov in Baltimore for many decades before emigrating to Sydney Australia to be near his son. 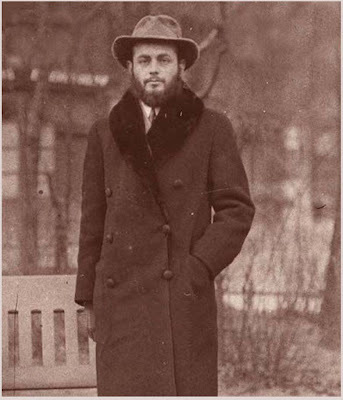 Most young Lubavitchers had probably never heard of Reb Mendel Feldman, and most definitely didn't know his brother Yitzchok, Berke Gurary's only friend. Other than Schneur, of course. 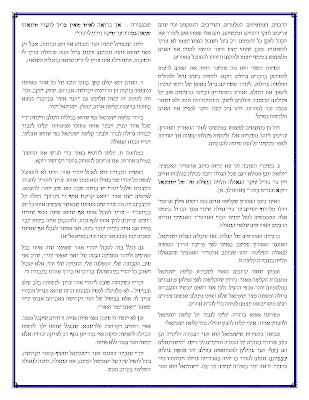 On Monday - when I started writing this post - there was a Levaya for the mother of a Lubavitcher Chossid here in Monsey. No "tragedy" per se', the woman was 92 years old. An email went out at about 11am that the levaya would pass our shul at 2pm and that burial would be at Sons of Israel cemetery on Brick Ch--ch road, half a mile down the road. That cemetery requires a post of its own, with a 7 foot stone wall separating the Vizhnitzer Beis Olam - where the Skulener Rebbe and Ribnitzer Rebbe are buried, and the Olamishe one, where such Gutte Yidden as Rav Mordche Schwab and Reb Nesanel Quinn are interred. The hearse - a Toyota Sienna minivan like a thousand others in Monsey - arrived at around 2:40, parked in the parking lot, lifted the tailgate, and the levaya began. Walking down the road. Maybe 200 feet, and the van pulled away, not waiting for the others. The procession then headed to their respective cars and drove the half mile to the cemetery, where the aron and the driver were waiting patiently. At the beis olam the ceremony was short and quick. 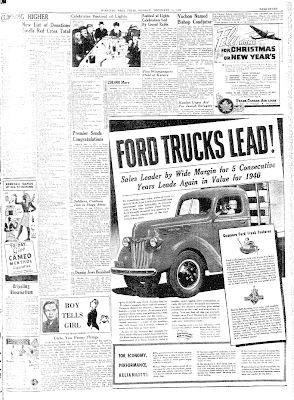 The aron was removed from the van and placed on the metal "bed" and then carried down the walkway to the open grave. Yoshev B'seyser was said seven times, stopping at the appropriate time. The Chevra Kadisha man was a seasoned veteran of seemingly Satmar stock who expertly instructed the novice procession of when and where to stop each time. After arriving at the kever the aron was soon lowered into the grave, with the said man barking out instructions of when are where to drop first. After being told "nisht ibergebben," the assembled worked for about 10 minutes covering the aron with the dirt and the shovels supplied, and the deed was soon done. Kaddish was recited by her three sons. Two rows of people soon lined up and the Aveilim took of their shoes and we're comforted by the assembled, who were warned נישט נאכגיין! An old pump on the side of the path with an old "Kvort" was used for washing hands. You need to actually pump the water out of the ground. When I started the engine in my car the clock read 3:13. It took a maximum of 40 minutes from the beginning of the levaya till after S'timas HaGolel! Where I come from, even a simple yid's levaya takes a minimum of 4 hours from beginning to end. There's going to the chapel and waiting. There's the hespedim, a minimum of three, at least one by his Rov, or Rebbe of the shtiebel where he davened, and family members, son, eydem, eynikel etc. Even in the death of an elderly man or woman there's usually lots of crying, and presumably some התעוררות too. Lots of time to mourn. The procession outside the chapel is usually for a couple of short blocks and the hearse waits for the cars that will follow to New Jersey of Long Island, an hour's distance. At the cemetery there's often another hesped. All in all you've been in the levaya mode for some hours now, and if you're an immediate family member you cried plenty too. Now compare that to the Lubavitcher levaya and see how much crying the Lubavitcher did for his immediate family member. I know that the minhag chabad is not be maspid, but it seems like the minhag is also not to mourn, or at least to minimize the mourning. At the aveilim house it's more nechomoh than aveilus, so that wouldn't make up for it. Just my thoughts, what say you? I really feel bad for Rabbi Shafran. He has to sit through this, listening to starry-eyed girls lecture about "social responsibility" and such. Kudos to him for going there and speaking his mind. In light of the ongoing Agriprocessors scandal that has rocked the kosher meat industry and the Orthodox community, Rabbi Avi Shafran, director of public affairs for Agudath Israel of America, Rabbi Menachem Genack, rabbinic administrator and CEO of the Orthodox Union's Kashrut Division and rosh yeshiva at Yeshiva University's Rabbi Isaac Elchanan Theological Seminary, Rabbi Basil Herring, executive vice president of the Rabbinical Council of America, and Shmuly Yanklowitz, co-founder and director of Uri L'Tzedek, will engage in a candid conversation on the interplay between ethics and kashrut at a program on Tuesday, December 9, at 7 p.m. in Weissberg Commons on Yeshiva University's main campus, 2495 Amsterdam Ave. at 184th St., New York. The program – "The Kosher Quandary: Ethics and Kashrut" – serves as the launch event for the new student-run organization at YU called TEIQU, A Torah Exploration of Ideas, Questions, and Understanding. The organization is devoted to nurturing intellectual dialogue on campus surrounding Jewish matters of import. The panelists will explain their views and insights on the kosher quandary, address recent developments and share their prescriptions for action. When: Tuesday, December 9, 2008; 7 p.m.
2495 Amsterdam Ave. at 184th St. The Nikolsburger Rebbe, residing here in Monsey, has seemingly made a name for himself. When I was growing up talk among my Satmarer friends was that he was a clown - if you'll excuse me. That's the way people spoke of him, as if he were some cult leader. 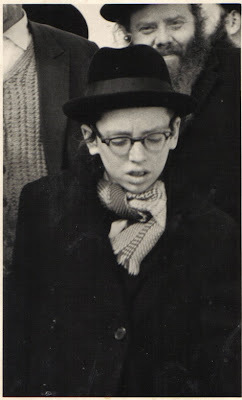 He was a Satmarer talmid, a Benon Shel Kedoshim, who bothered some people with his Rebbishe antics, so they chucked him out of Satmar in the early 80's sometime. As it that wasn't enough somebody decided that it was a good idea to involve his wife in this matter and turn her against him too. The end result was that they went to the Rov, if you know what I mean... Badchan Yoely Lebovitch is his son from his first marriage. The Nikolsburger Rebbe has created a fusion of a very frum yet very accepting chassidus where all are welcome and all are treated admirably. It may not be a mainstream group like the big ones but I hear good things about the place. One of the things they said about him even back then was how charismatic he was, and that you had to be "careful" not be "farchapped" from him, especially when he says Torah. Well, it seems like has made it his mission to get the word about the NR, posting video on youtube and other sites, this in addition to the "official" website I've seen somewhere online. One such video is the one we posted above, an actual audio clip that has a static image on the "cover." He cries bitter tears at the death of the 6 Mumbai Kedoshim, and let me tell you - call me a woos and a softie if you like, but it took me a few minutes to dry the tears that flowed when I heard him cry and scream about the deaths and what a terrible tragedy it was. There seems to be genuine pain for the suffering of the murdered, the families, the yesomim, and for the entire Jewish people. The bechiyos there are astounding. There's no talk of the Zionists, nor of flag draped coffins, nor of funerals in Hebrew and Presidents and Ministers eulogizing. 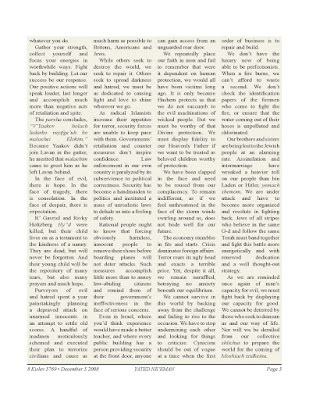 It seems like you can be a devoted Satmarer and not be a heartless fool like the writer of the editorials in Der Yid. Not that we didn't know this before, but it's reassuring nevertheless. Some of you here questioned Rabbi Pinchus Lipschutz's credentials and his general relationship - or lack thereof - with the Babylonian Talmud. You said he was a "BalleBus" and that he doesn't represent when he writes. 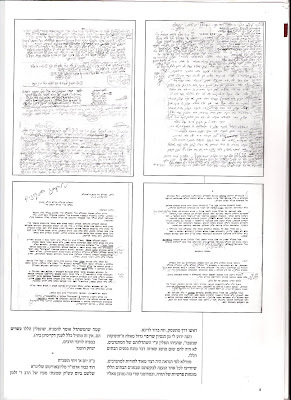 We recently received an authentic copy of two approbations received by a then-unmarried Lipschutz to a sefer he wrote - um, compiled- in honor of his deceased mother, a"h. They include Harav Moshe Feinsten, zt"l, and Harav Yaakov Yisroel Kanievski, zt"l. Not bad for a young American lad. See them as you wish. We thank the reader who sent it in. Something must've happened to the Hungarian mind somewhere along the way, because they've totally lost it. How nice of them to - in their own mind- hold off on further criticism until maybe NEXT week! Can we ever expect for any sort of achdus with this being the approach and mentality among some of our brothers and sisters in Williamsburg?! Will The REAL Pinchos Lipschutz Please Stand Up?! In the forefront defending Rubashkin, and now this. Ladies and Gentleman: I believe the Yated bears some re-examining. Gone are the days of 15-20 years ago. This looks and feels sincere, not worrying about repercussions or backlash, straight-from-the-heart cries of anguish. Thank You Rabbi Lipschutz, the Kovner Zeide would be proud. I do not condone that site as a whole, but we can rely on Chaim G's (aka Bray of Fundie) opinion as being based in Torah. "ועמדו רגליו על הר הזיתים"